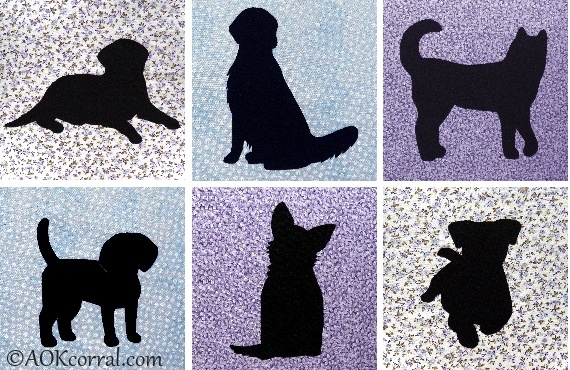 Add a dog to your project or quilt with our dog applique patterns. There are 6 different dogs in 3 different pattern sizes so you can add our appliques to a variety of dog projects. Bonus: The Easy Print Version contains all 6 dog applique patterns and each dog comes in 3 sizes. © Copyright 2014 by AOK Corral Craft and Gift Bazaar All rights reserved. Dog #1 - Sm 5.25" x 3.25", Med 7.25" x 4.25", Lg 8.25" x 4.75"
Dog #2 - Sm 4.25" x 4.25", Med 5.75" x 5.50", Lg 6.50" x 6.50"
Dog #3 - Sm 4.25" x 5.00", Med 5.50" x 6.50", Lg 6.50" x 7.50"
Dog #4 - Sm 4.50" x 4.25", Med 5.75" x 5.25", Lg 6.75" x 6.25"
Dog #5 - Sm 3.00" x 4.00", Med 3.50" x 5.00", Lg 4.25" x 5.75"
Dog #6 - Sm 3.00" x 4.50", Med 4.00" x 5.50", Lg 5.00" x 7.00"
Cut out the pattern for the size of dog that you wish to appliqué. Cut out the dog pattern through both the fabric and paper, and then peel off the paper backing. The PDF version (available below) contains patterns for all 6 dogs in 3 sizes each! Use these dog patterns to applique or embroider onto quilts, linens, clothing and more. © Copyright 2014 by AOK Corral Craft and Gift Bazaar. All rights reserved. *This version includes 6 dog applique patterns and each dog comes in 3 sizes.